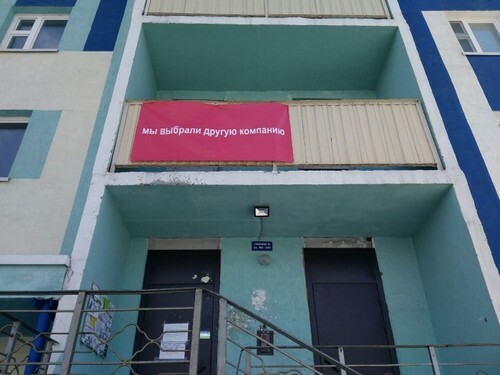 17-storey building at street Odoevskogo 1/9 in Pervomaisk area of Novosibirsk hung three red banner — the residents accused major provider “Novotelecom” in an unfair fight for access intercoms. Photos with banners with inscriptions “that had not appreciated — losing wail”, “we chose another company and novotelekom — stop terrorizing our house” (original spelling preserved) appeared in the group “KSM and birch,” the social network “Vkontakte”. “They (“Novotelecom”. — I. K.) that block the door, then take off our plates, which “Cyfral” set [interphone] blocks night come and remove, then something is coded, people are generally in a door but couldn’t hit. <…> Banners [we] hung, because they are already quite tired,” — told the correspondent of NGS member of the house on the street Odoevskogo 1/9 Elena Ivanova. According to Elena Ivanova, the story of the division of intercoms between “Zefram” and “Novotelecom” began in 2016. Then both companies turned to the residents with a proposal to provide services in their home. Initially, the control over the entrances have “Novotelecom”, which planned to put on the doors and inside the entrances of the cameras and issue chip keys, but, according to Ivanov, did not. Then, according to a member of the Council houses, the residents held a meeting and chose another service company intercoms. The meeting was held in March 2018 — after that the problems started with the intercom, says Elena Ivanova. In “Novotelecom” from comments have refrained. The city’s residents are regularly faced with attempts to establish control over the intercoms of the different companies. At the end of 2017, part of the intercoms in Novosibirsk was destroyed by vandals.